Elfred, Jack’s BFF for 3 years. Styrofoam cup crown, Magic Loom (TM) belt and bracelet designed by Jack. Dried, unidentifiable dairy product on left sleeve also fashioned by Jack. On Christmas three years ago, Santa gave Jack an iTouch, with a special engraving on the back from Elfred, telling Jack that he was Elfred’s “best friend.” Jack beamed with Christmas joy. Unfortunately, “Santa Dave” didn’t consult with me first before accompanying this gift with a beautiful, calligraphy fonted letter from Elfred on linen paper, announcing that as of this Christmas, Elfred would be living with us year-’round. The thought balloon above my head replayed Ralphie in that flat tire scene from A Christmas Story: “Oh…FUDGE…” My spirited chat with Santa Dave later that evening teed me up for a five-course meal of Life Buoy soap. So this Elfred charade went on for three excruciatingly long years. Like any busy adults, we got careless. It happens. 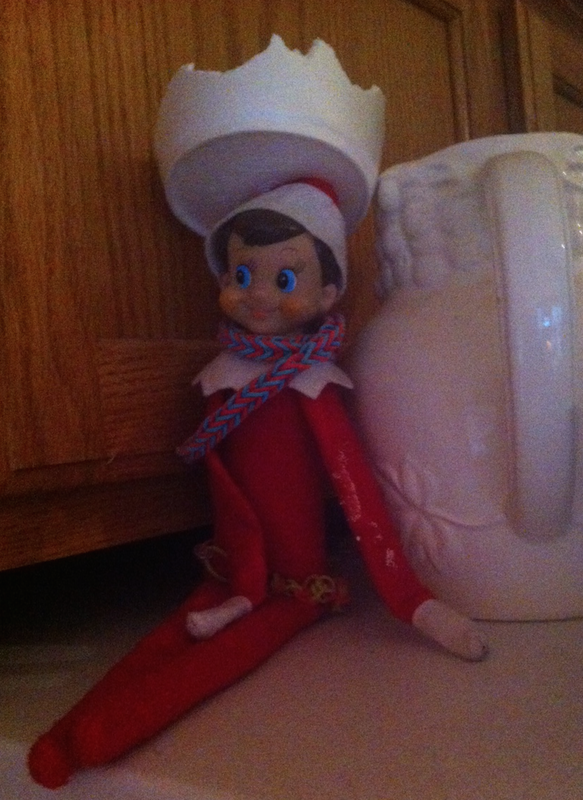 We’d forget to move Elfred for days–even weeks–on end. Jack was getting increasingly upset by Elfred’s lethargy, convinced his little elven buddy was dying. One morning, in my attempt to explain it away, I blurted out, “Well, he gets his magic from the North Pole, right? We just need to put him in the fridge to regain his magic!” Jack was satisfied with that answer. Problem solved. But every time I opened the fridge, I would startle, not expecting to see that creepy little elf face staring me down. Elfred became dieting MAGIC. P.S. As for Elfred, the last I heard, he joined a motorcycle gang out of Albuquerque. If you cross him, you’ll know him by that tell-tale stain on his left sleeve.